Close to High Street and cafe culture area. Ground floor 47.49 sqm 508 sq ft, rear parking. Tenanted first floor one bedroom flat. Fixtures and fittings available by negotiation if required. 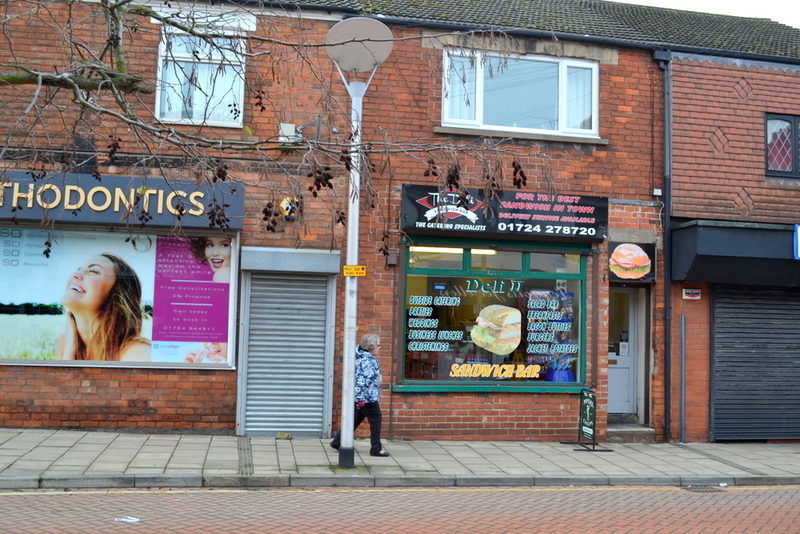 The subject property is situated within the centre of Scunthorpes main retail activity on Ravendale Street North. Part of Ravendale Street North is pedestrianised and links to High Street. The subject property is situated within Scunthorpes inner traffic management area with the road outside being one way but has allowable free on street parking. A short distance to the east is a large pay and display car park. The unit is close to this pedestrianised area with this part of the town being known for a variety of cafes and tea rooms which utilises street furniture along with externally placed tables and chairs. Within the vicinity of the subject property is a small supermarket, furniture retailer, clothes shops, hairdressers and beauty outlets along with Leggotts jewellers and Scunthorpe Orthodontics. Mid terrace unit constructed in brick beneath a tiled roof with accommodation set out on ground and first floor. GROUND FLOOR, used as a sandwich and catering outlet for numerous years. Front elevation with display window and roller shutter security along with signage facility. Side single personnel entrance door. Sales area with vinyl floor covering, fluorescent lighting with wall coverings to a mixture of surfaces including wood boarding. Two storage areas, kitchen with extractor, door to exterior. WC accommodation. FIRST FLOOR, accessed via an external metal staircase to a flat comprising living room, kitchen, bathroom and one bedroom. EXTERNAL, two parking spaces. The property is entered in the rating list as Shop & Premises. Shop rateable value £4,550 per annum. Flat council tax band A. Interested parties are advised to contact the Local Rating Authority as to whether any rate relief is available. The subject property is available by way of a freehold sale with vacant possession to the ground floor. The first floor is tenanted on an Assured Shorthold Tenancy with the tenant paying £350 pcm along with a contribution towards water. We understand that the tenant to the first floor has been in occupation for approximately 3 years. Should a similar use to the ground be considered then fixtures and fittings can be available by negotiation.